43 by 30cm., 17 by 12in. Regina Cordium (Queen of Hearts) of 1866 depicts a flame-haired girl holding an orchid and standing at a parapet with an elaborate wallpaper behind of cherry-blossom growing on a trellis and pink roses in the foreground. The painting was commissioned by J. Hamilton Trist (see lot 127 for another picture from this collection) and is now in the collection of Glasgow Art Gallery and Museum (FIG 1.). Treffry Dunn recalled how Rossetti had first seen Miss Wilding (whose first name was in fact Alice, although in due course she adopted the more exotic 'Alexa') when she was walking in the Strand and how he had besought her to allow him to paint and draw her. sitter, and with a kind of beauty which was passive enough to allow her to adopt a wide variety of personifications and roles. Over a period of several years he paid her a small salary that she should model for him exclusively, perhaps because it was known that other artists - notably John Everett Millais - desired to paint her. knew her, or on the basis of her representation in Rossetti's paintings and drawings. feature, [and] full of a quiescent soft mystical repose that suited some of his [Rossetti's] compositions admirably, but without any variety of expression'. William Michael Rossetti, Dante Gabriel's brother, found her physiognomy more demonstrative, describing 'a head of fine and rather peculiar mould, eminently strong in contour and also capable of much varying expression'. 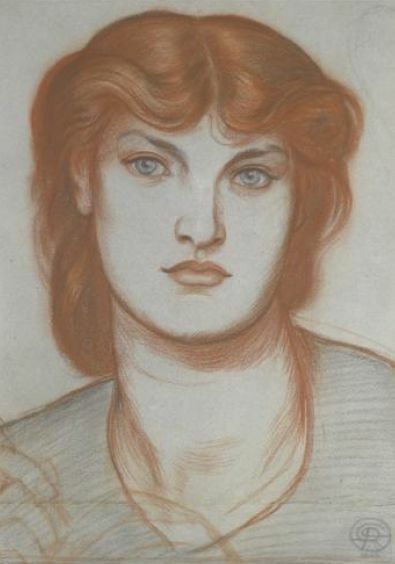 Frederic George Stephens believed that 'in regard to her form and air, he [Rossetti] never adopted a more exquisite form of womanhood, per se' than 'the beautiful Miss Wilding', explaining that Rossetti's representations of Alexa were quite personal and dependent upon his own feelings for her: 'So many differently inspired versions did Rossetti give us of the beauty of Alice Wilding. Nevertheless, I dare say, not a little of her charm existed mostly in the passionate heart of the painter; yet I well remember that nothing he drew of her, diverse as the delineations were, seemed less than an exact likeness'. Rossetti. Gradually, however, she drifted out of his circle, and by the late 1870s was modelling for him only on rare occasions. Two children were born to her, in 1876 and 1877, although Alexa seems not to have been married to their father. The second version of Rossetti's Sancta Lilias of 1879 (Virginia Museum of Fine Arts) was his last painting for which she served as a model. H.T. Dunn described how Alexa, after Rossetti's death in 1882, made an expedition to the churchyard at Birchington-on-Sea to lay a wreath upon his grave. She herself died in 1884, aged thirty-seven. Biographical information about Alexa Wilding, and a detailed account of her relationship with Rossetti, is given as Appendix 3, 'Monna Innominata: Alexa Wilding', in William E. Fredeman (ed. ), The Correspondence of Dante Gabriel Rossetti, vol. VI, Cambridge, 2006, pp.605-45. See also, Simon Toll, 'Dante Gabriel Rossetti's discovery of Alexa Wilding', British Art Journal, vol. VII, no. 2, pp. 87-91.